Following the Kirigami guidelines this is the front page at "normal" scaling. In general I am not a fan of all the blue separator lines used. I think we should only use them as a highlight effects, to draw the attention of the user towards it. Using it too often and it become just meaningless noise. I think we can use a different, more neutral color for the same effect or often even get rid of them e.g. the Details view in picture 7 between "Kate" and the subtext. I am also not happy with the navigation re:Search. Ideally, I think we should either have the whole search business going on in the left drawer/pane or in the center. I think the Kirigami HIG might be a bit lacking for this use case. It should allow for some kind of toolbar where we can put the search entry field. Especially on mobile phones, where you want to enter search term AND get a look on the results in the same view. If it was in the drawer only you'd not be able to do that. What is that? Tags, tabs etc.? If they are tabs like things, you should stick to the default text color. If they are more like tags, I think blue is acceptable. Don't use blue for that. It should be reserved for highlights and links. I would move this button to the top, or center it on the drawer. For real though, giving the available updates a more prominent highlight than the currently selected category seems a bit too much. review result from jens mockups left panel search and filter second column search results third detail view. +1 for pstefan. what I don't understand is that the picture height isn't the same than in the right window. I like it but as pstefan describe it should look like something the user know. maybe an toolbar but than I would move them to bottom cause kirigame use bottom toolbar as fare as I know. I think here is a mix you have in the sidebar the search feeld but the result area is in the main frame. you show here Home > Search: Kate and than Search: Kate one thing should be enough. maybe add something like show more and you come to the detail view but also if you click somewhere else you go to the detail view, but have always the same "layout" (detail view and overview page) would be awesome. I like this column based approach. very nice but the search area look a bit to much information on top. maybe when you add the filters on bottom. make the line gray instead of blue cause blue is for highlight / select but there is nothing highlighted. you wrote here "search for extensions for this application" if you search for kate than the search result should show also the extensions and alternative apps. the problem is when you search after text editors you will get a big list and when you go to kate (detail view) the search maybe can modified automatically to show on top kate than the extensions and than the old search result so something like a more detail search of the thing you select. please show us also which packages will be installed when you click install and where the files are located when the software is already installed. do we really need this cause there is the sidebar when you click to updates available or applications, .... you will jump to "Home"
We aren't showing the size in the application display. It was considered as something important in the former design, maybe it's something to reconsider. We aren't showing the size in the application display. What do you mean by "application display"? In the detail page, the size is shown, right at the top. I would not show it in the list, though, assuming that people who install right from search results already know the application. If they want to know more, the click on it to see the details. what I don't understand is that the picture height isn't the same than in the right window. Would line breaks be a problem here? I'd user-test that and see whether they realize it's clickable and what it does. The idea here was to always start with the search from the sidebar and then if you realize the result list is too long, you narrow it down further with filters. It's also something to user-test. Indeed, that's something I also suggested at some point. Just having a "fake link" for people looking for something to click on. But again this is something which can also be tested with users. It should, but you might have come to the page in other ways than searching, so offering a way to get to extensions from the detail page does still make sense. Sry just a quick comment about blue line - its not part of it as a seperator but as a visual flair thing. We can remove the line if you guys think it wont fit at all. We can remove the icon and simply display a grey area - but packing it with buttons and links wont work as that would require more buttons. If there is a suggestion for another visual - I am all go. Search for Extensions is only within the application meaning the list is tiny in comparison. "Installed" sounds like a good idea to add. The reason for the images not being the same height is to divorce the sidebar from the main view. We can remove one if you guys like. we can change the colour to dark grey in "search kate" (/nonclickable). the blue "search deep" ones are indeed tags of sorts. Essentially clicking one bring you directly to the second level of the search narrowing it based on the category chosen. I don't think it should be a hard requirement though. Android doesn't have one either. It is mostly used when you have several user accounts you can switch between. I don't think it's wise to show something only for the sake of it. I don't know, tbh. We'd have to see. I think it would look a bit odd with a such big font weight. And depending on the language one might encounter this case more often than in others. I find that to be strange UX wise. How would it work on mobile? As is, I'd assume one could not see the search results on mobile if one starts the search from the drawer/sidebar. That doesn't sound right though. Since one can combine these tag like things in a query (+spelling), I would make them look more like selectable categories too. Like in Dolphin's search, or the one in the Steam shop. Perhaps another way to think about it: How would one remove one of the categories from the query? I feel the way it's currently designed is too akin to the look – and thus expected behavior – of tabs on several big mobile OSes. 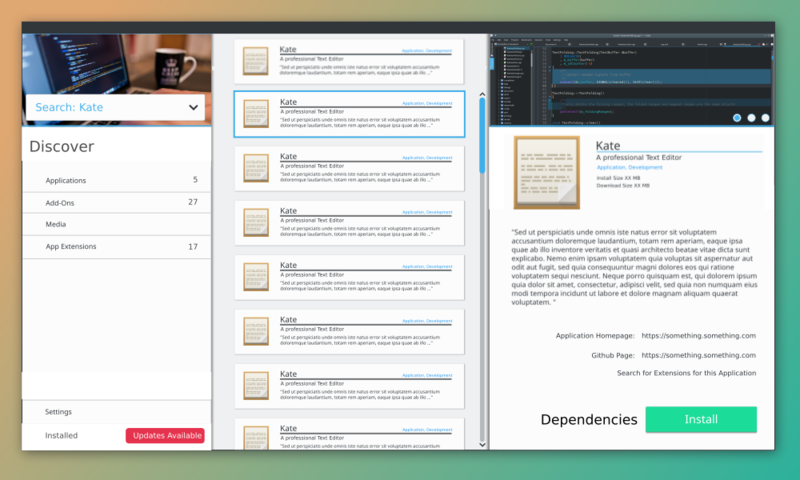 colomar renamed this mock from Discover Front Page Kirigami redesign to Discover Kirigami redesign. The update screenshould show the release notes of the updates instead of the description of the app. Which would we want to show? Which wouldn't we? I've been looking into this and it doesn't look like it will be easy to implement. Do you think it would make sense to specify the progress in a pie-like widget on the right? Are specific link types defined in the AppStream spec? It's easier because we need to swap the background with the current proposal.